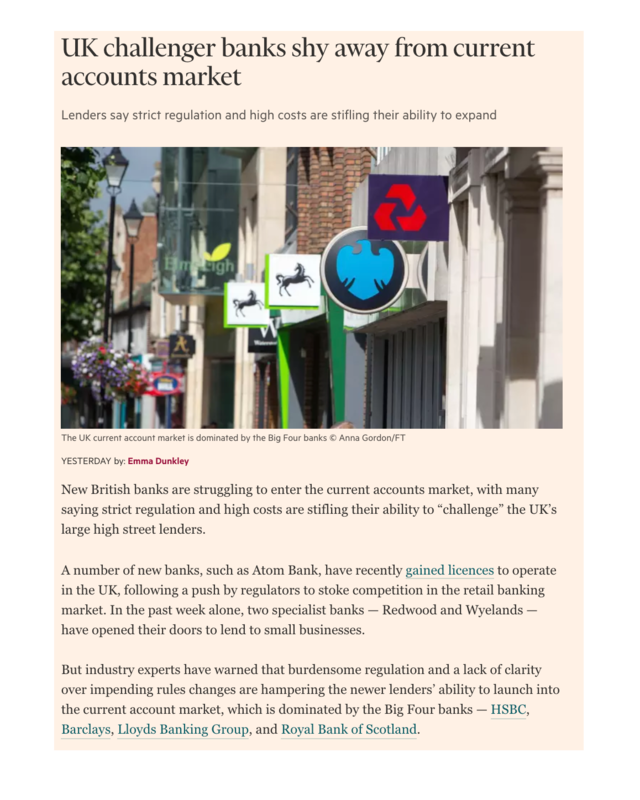 News in the Financial Times today that challenger & “digital only” banks in the UK have hit regulation issues should not be a surprise. Digital disruption is hard, especially in well-regulated industries such as banking and transport. Uber openly ignored some of the early regulations in many countries, and ended up being regulated. For challenger banks, they need to be nimble but also need to “look like” a large bank with liquidity if you are holding people’s money. The situation with “open banking” is that the bank may not be the ultimate owner of the customer relationship – that may fall to value-added FinTechs who get the job done more efficiently. When an industry is being disrupted, someone needs to coach and counsel the regulators so that they don’t stand in the way of real change. The current Open Banking program in the UK is beset with lobbying by the incumbents for the status quo, while the challengers want more freedom. So who is educating the regulators in disrupted markets, who should be performing this role?